If you’re over 50 then it’s likely you remember the old fashioned Soda Shop. My Dad, Rocci Curci, owned one for many years and the memories of those days linger blissfully in the minds of our local residents. 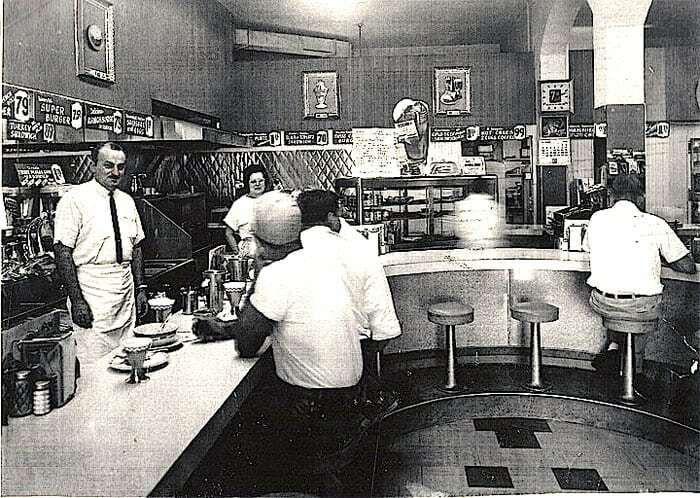 The “Pup” as it was more commonly known, was located at 1383 Lincoln avenue, among a string of shops on the south-west side of the avenue with Lawrence’s Drug store, Pat Pooler’s jewelry shop, Buck’s Willowette bakery and Bergmann’s Department store. The Pronto Pup was a favorite teen-age “hang-out” during the 1950s and ’60s. Not to mention the most popular burger shop of the day – long before Big Macs and Whoppers came on the scene. Dad entered the Willow Glen business trade when he purchased the Pronto Pup creamy from Hal Hanford in 1951. The Fabulous 50’s were about to explode on the American scene and a new lifestyle and generation of jukebox worshiping, cherry cola drinking, burger eating teenagers were going to claim the local soda shop as their home away from home. In the Pup’s heyday, young residents of Willow Glen made it a habit to patronize the local shops. Two-car families were very rare at that time and few teenagers owned a car of their own. Dad was usually the sole owner of the family automobile and he took it with him to work each day, so if you wanted to go somewhere you had to depend a good deal on your feet or public transportation. For us teenagers, Rocci’s Pronto Pup is where the action was and where they wanted to be. Like most soda shop managers, dad had a friendly, charismatic personality that just naturally attracted customers. He possessed a funny wit that kept the kids laughing, but he also had a way of keeping the rambunctious teens well behaved. The kids came to the Pup every day to exchange stores and jokes with Rocci and their school pals and to sit around reading the shop’s magazines and sipping on icy cold cheery colas. I Remember how all the teens used to read the comics and Hollywood magazines until the pages were dog-eared and then when they were finished reading they returned them back to the rack. One day, when Dad got frustrated with this loss of magazine revenue and had a sign made and hung it over the book rack. The sign read: “THIS IS NOT A LIBRARY … ALL MAGAZINES, BOOKS AND COMICS TAKEN TO COUNTER WILL BE CHARGED TO CUSTOMER.” From that day on, Dad’s magazine sales increased considerably. The Pronto Pup wasn’t a very large place, but what it lacked in size it made up for in warmth and hospitality. If you came to the Pup for dinner, Rocci would make sure you didn’t leave his establishment hungry. With just a two-burner stove in the back room, he managed to serve up an entire three-course T-bone steak dinner with all the trimmings – all for only $1.50. Everything from pancakes to burgers or chili beans to spaghetti could be found on Rocci’s varied menu. Dad used a lot of hamburger patties in those days and making the patties from scratch was a tedious job. The hamburgers were patted into a ball then placed on a patty maker. The handle on the maker was firmly pushed down, then pulled up again. As if by magic, out came a freshly flattened patty firmly pressed between two pieces of wax paper. The process took all morning to make enough patties for the lunch crowd. If a customer came to the “Pup” looking for a good magazine or a Pulp fiction novel, they found it. The walls of the creamery were lined with wooden shelves filled with paperback books, comics and newspapers. The Pup’s magazine racks held the largest selections of books and magazines in the Willow Glen area and most of San Jose. If it was ice cream you were looking for, you wouldn’t be disappointed, a large selection of Carnation had packed ice cream on hand, and his soda fountain had a complete selection of syrups and flavors for every type of ice cream sundae or shake. A large glass enclosed candy case greeted customers as they entered the creamery front doors. Before going to the Garden Theater most kids took advantage of the Pup’s 5-cent candy prices and purchased their candy there. Behind the long, horseshoe counter, Rocci made good use of his wall space to display an assortment of sunglasses, razor blades, pipes, and pipe cleaners and nail clippers. On sale, in the shops refrigerator, was a selection of Par-T-Pack and Lit’l Squirt colas, orange juice, fresh milk, eggs and cottage cheese. Even a Kleenex machine that dispensed purse size Kleenex. And pay telephone, where a nickel bought you a phone call. The old Pronto Pup was like the neighborhood “quick stop” market of its day. On the walls hung merchandise of all sizes and shapes. Sunglasses, nail clippers, razor blades, cigarettes, cigars, cigarette holders, boxed candy newspapers, key chains, hair combs and emery boards. When school let out for the summer, the Pronto Pup’s atmosphere began to change, it hummed with a certain energy created by noisy teens and the relentless sounds of Rock & Roll that blared from the corner juke box. Regulars such as “Spoonie” “Herk” “Pebbles” “Red” and “Jonsey” were among the high school kids who kept the place jumpin’ with music, jokes, laughter, shooting paper straws at each other, or tossing a tattered football around. Mostly, I remember my Dad, Rocci, flipping a half dozen burgers on a sizzling hot grill while he joked and kidded around with the “Pup’s” regulars. I remember the laughter and private jokes we all shared with one another while I scanned the latest issues of photoplay and teen-beat magazine and swooned over Ricky and Elvis. I remember how I weighed myself on the penny scale and got my fortune told in the process. I don’t know if that old fortune telling machine ever gave me an accurate reading on my future, but one thing I can say with certainty, the old gang at the Pronto Pup, and that funny ol’ fortune telling machine gave me some warm and wonderful memories to look back on.